Fuji-Hakone-Izu National Park (富士箱根伊豆国立公園) straddles Yamanashi, Shizuoka, Kanagawa and Tokyo prefectures. The Fuji-Hakone-Izu National Park is a sprawling 1200 sq.km. 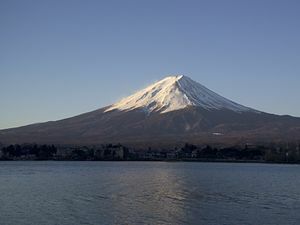 zone that covers not only Mount Fuji itself, but also the Fuji Five Lakes, Hakone, parts of the Izu Peninsula and all of the Izu Islands, stretching several hundred kilometers south from the Japanese mainland. While the park is dominated by Mount Fuji, which is (in good weather) visible from all parts except the southernmost islands, the local landscape is in entirety volcanic. In particular, a number of the volcanoes on the Izu Islands are still active. Routes vary widely depending on where exactly you're going, but it's safe to say that the most common starting point is Tokyo. Cities near the park include Odawara, Fuji, and Numazu. The volcanic activity of the park means that there are hot springs galore. Those in Hakone are the easiest accessed from Tokyo, but the Izu Peninsula is also a popular weekend getaway.